Bananas are high in iron and help stimulate the production of hemoglobin in the blood. They normalize bowel functions and are one of the few fruits gentle enough to eat with ulcers. Bananas contain vitamins A, B6, B12, C, magnesium, potassium and the amino acid tryptophan. (Tryptophan is known to help balance mood and induce sleep). A fully ripe banana with dark patches on the yellow skin produces a substance called TNF (tumor necrosis factor) which has the ability to combat abnormal cells. The darker the patches are, the higher the anti-tumor quality. 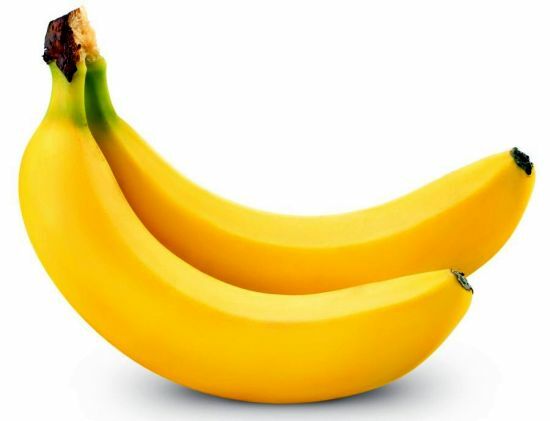 Bananas are considered ripe when there is no green left on the peel and a few brown spots are present. The type of carbohydrate in bananas varies depending on their ripeness. If you eat unripened bananas, the sugars in them will be in their starch form which can be hard on digestion and may cause constipation. Once your bananas are ripe, almost all the sugars will have been converted to glucose and fructose which are easier to digest and can actually be used to relieve constipation. Since freezing causes nutrient values to drop slightly, it is best to freeze very ripe bananas. Bananas contain three natural sugars (sucrose, fructose and glucose) as well as fiber. A banana gives an instant, sustained and substantial boost of energy. Research has proven that just two bananas provide enough energy for a strenuous 90-minute workout. No wonder the banana is the number one fruit of the world’s leading athletes. Energy isn’t the only way a banana can help keep us fit. It can also help overcome or prevent a substantial number of illnesses and conditions, making it a must to add to our daily diet. You can use bananas in place of dairy to make a creamy and very sweet smoothie. This entry was posted on March 8, 2015 by thrivecoach12 in Fruits, Nutrient Values and tagged banana, energy booster, iron, normalize bowel function, prevent illness, tryptophan.